FishFlix.com is a wonderful company that I have gotten to purchase from many times. 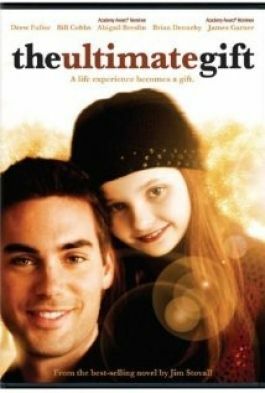 This time they gave me the chance to review one of their DVD's, The Ultimate Gift. FishFlix.com is a company that provides a place to buy movies that are Christian and Family friendly. They have a wide variety of DVD and blu-ray movies to choose from. When you pick a movie you can know you are choosing something wholesome. They are helping bring family time back in a Christian manor, which is such a great thing these days. The Ultimate Gift is one of the movies or crew got to choose from. It is about a man named Jason. Jason is what you would call a trust fund baby. He come from a family with lots of money. He has never had to work or do anything in his life to ear his way. This has made him become arrogant and uncaring of anything but himself. His grandfather, Red, and him did not have a good relationship when Red passed away. This movie plays around Red having used a video and series of tasks for Jason to earn his inheritance. I'll leave the details of those for you when you watch the movie. I will say these events lead him to meet a little girl named Emily and her mother. Emily has leukemia and helps Jason reach this goals set by Red in an amazing way. I promise you that the story will keep you in tuned and you will be on your toes through the twists and turns. I watched this movie with all my kids. I would say this is a good family movie for all. Though small kids may not get the point, my kids did. My kids are 11, 9, and 7 and got the point of the movie. It was a nice family movie night and we all sat to watch. During the movie the kids had lots of commentary about what was going on. It allowed for a good conversation for us after the movie was over. We were able to talk about how important it is to be grateful for what we have and not take it for granted. We also see that we have to learn to do things when we are young so that when we are older we can care for ourselves with out depending on everyone else to do it for us. It was an amazing movie and I will admit I was brought to tears by the end. It was so great to have a movie that was good for us all to watch as a family. So nice not having to hurt and cover eyes or cough to cover things kids shouldn't hear. I really think anyone one of any walk of life would love to see this movie. Be sure to check FishFlix.Com out on social media as well. Also click below and see what my other crew mates had to say about this movie as well as other from FishFlix.com.